22 Bright Led Beads: Meets the need of lighting needs in various places. 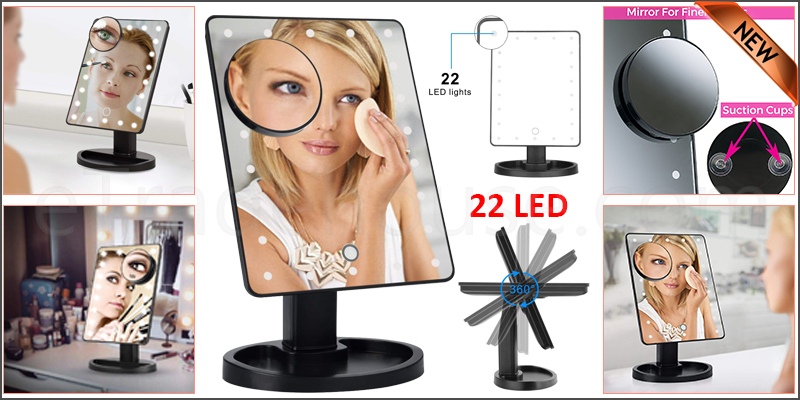 This modern-looking magical makeup mirror with 22 Circled LED is a perfect decor to add ambience to your bedroom, bathroom, vanity countertop. 360 Degree Rotation: fix at any position to give you the perfect viewing angle. Smart Infrared Touch Button: Designed with sensor controller to access to brighter or darker lighting effect, all through your finer touch. Smart touch button, long press the touch button to adjust the brightness freely, turn on/off the light. Accessories Storage: Unique Grove Holds your small items like watches, cosmetic, brush, ear studs and rings.